Summer time often brings a few infectious ailments to beef cows. Common problems include eye infections and foot rot. 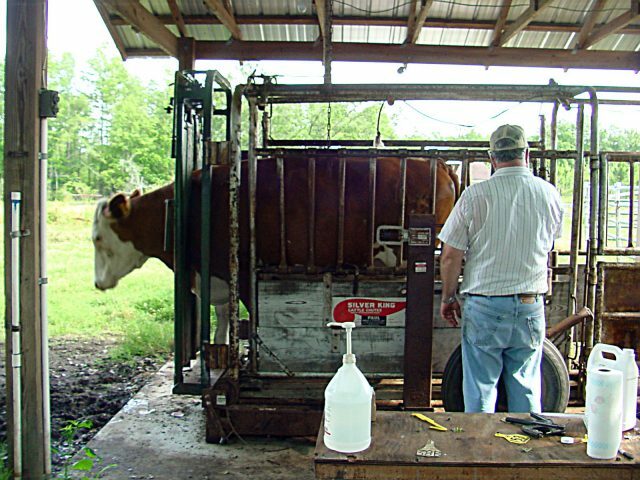 Treatment of affected cows will often involve the use of antibiotics. In the past, and on very rare occasions, violative residues of pharmaceutical products have been found in carcass tissues of cull beef cows. Violations of drug residue regulations can result in expensive fines (or even worse, jail time) for the rancher and a “black-eye” for the entire beef industry. It is vital that cow calf producers have a close working relationship with a large animal veterinarian in their area. If a cow has an infection or disease that must be treated, her owner should closely follow the veterinarian’s directions, and also read the label of the product used. Most of these medications will require that the producer keep the treated animal for the label-directed withdrawal time. The Oklahoma Beef Quality Assurance Manual contains the following discussion of medication withdrawal times. If ever in doubt, rely on the veterinarian-client-patient relationship you have established with your veterinarian. Use only medications approved for cattle and exactly as the label directs or as prescribed by your veterinarian. Do not market animals for food until the withdrawal time listed on the label or as prescribed by the veterinarian has elapsed. Keep well organized, detailed records of pharmaceutical products given to individually identified animals. Include in the record, the date of administration, route of administration, dosage given, lot or serial number of product given, person delivering the product, and label or prescription listing of withdrawal dates. Examples of Beef Quality Assurance records can be found in the Oklahoma Beef Quality Assurance Manual website at the menu item “Record Keeping Forms” . Records should be kept for 3 years after sale of the animal.